As you can see, the input sequence does not need to match the output sequence in length. The most common seq2seq method is to use an Encoder-Decoder structure. The concept is relatively simple: the model first translates the input into a “thought vector” and then feed it into the decoder, which would decode it into a sequence of output. You may find the model described in very fine details in Keras’ documentation. It is actually quite complicated in that it required the encoder to return sequences as well as the hidden states, which is used to initialize the states for the decoder. Apartment from that, the example in the documentation is quite illustrative. you may notice that I used character-level time series instead of word-level. In the example that I will give later, it is perfectly fine as the time series are quite short. In your application, you may find word-level input is better. However, this totally depends on your data. Another thing you may need to pay attention is the length of the time series of your output. Say if you are translating from Chinese (short) to English (much longer than Chinese), you may need to apply other technique such as attention etc. The point of this blog, though, is not to talk about the encoder-decoder model for you will find an abundance of literature to better understand its design and limitation. Instead, we will focus on a multiple input encoder-decoder model. It’s easy for the machine to calculate 11+10=21 if they are integers; however, if they are chars and you don’t allow the algorithm to cast the strings into integers, they become a lot harder. But, wait, didn’t you mention multi-inputs in the title? Most Keras examples on the Internet are about using the Sequential() model. However, it won’t apply in this case. We have two set of inputs and they must both be fed into the neural network concurrently. Furthermore, they don’t have the same dimension. The text input is a 3 dimension input (num_samples x time_series_length x feature_per_step) while the base input is a two dimension (num_samples x categorical_encoding). You can think of this as the two dimensions of the input, similar to images’ channels. However, we cannot apply CNN in this case since 1) they are not the same dimension; 2) we need to have long-term memories to encode and decode sequences. 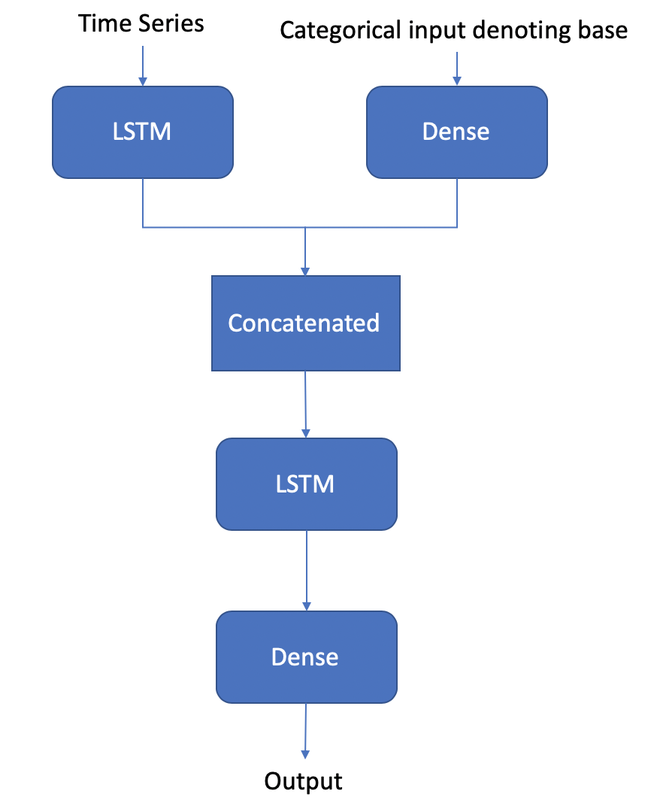 Although, in theory, you can pad the base input to match the dimension and stack CNN on top of LSTM, I am not sure how well the model would perform. Another thing perhaps you can also try is to append the base sequence to the back of a fixed-length encoding sequence of every character and feed the time series into the LSTM layer or an encoding layer then LSTM layer(s). I am not sure how well that’d perform either. Keras has functional APIs that allows us to manipulate the layers and model structure in a very refined way and that’s exactly what we will use. So here is the game plan. In the e-book by Jason Brownlee on LSTM . He proposed something entirely different from the structure in Keras’ documentation. He took advantage of the RepeatVector layer, which repeats the output n times instead of making the LSTM return hidden states and output sequences; additionally, he also took advantage of TimeDistributed wrapper, instead of initiating the output sequences with a start token. I tried both models and find they perform almost equally (while Jason’s LSTM model is slightly slower to train). The models given the same set of input requires different hyperparameters, which alludes to my second topic in this topic: Talos. It’s designed to help you automatically tune hyperparameters. I found Talos much easier to use than Hyperas, although it seems to offer more powerful tuning. Keras also has callback APIs to allow users to have early stops. But that may not be enough when you want to try different distributions and combinations of hyperparameters. It has 2x3x3x3x2x2=216 combinations of hypermeters to try out. If you have powerful GPU(s), you can even try multiple combinations at the same time. It basically tells me that per iteration is approximately 112.59 seconds on my computer and I have 216 iterations to go through. So that’d be around 6 hours. In the example above, you can see that I padded the input text to a fixed size and I chose the max length of the time series by calculating the max number in binary format. Hence, you see ‘p’. I also used one-hot encoding with a length of 4 to denote the base. This is categorical data, so using integers is not recommended. Those zero vectors are essentially paddings. After using np.argmax, they are converted to indices, which then later converted to actual char by using a look up. Hope you enjoy this blog, let me know if you have any questions. Next Post:Thanks for the input!